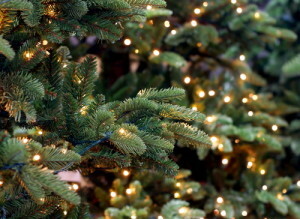 Searching for the best place to buy Fraser fir garland strands? We have all lengths and sizes available. We are taking orders for the 2015 season! Give us a call. Fresh cut Fraser fir garland makes a great addition to Christmas décor and can adorn staircases, fence posts, mantels, tables and so many other areas. We’ve even seen it strung from chandeliers. Add a touch of the mountains by draping Fraser fir garland roping along your door frames and windows and you’ll get the heavenly smell that you desire. That’s because the Fraser fir, or Abies fraseri is one of the most fragrant evergreen trees. They are native to the Appalachian Mountains. We carefully grow our firs in the Blue Ridge Mountains. Our Wholesale Christmas trees are award winning and we were chosen to provide the Vice President with a Christmas tree for the 2016 season. We recommend getting your wholesale Christmas garland orders in early so that we will know how many trees and cuttings we need to place your order. The earlier the better, but we would be happy to speak with you even if you think that you’ve waited too long to order Fraser fir garland this season. You never know, we are well networked with other Christmas tree growers and we will most likely be able to help you. We create all of the garland strands by hand using the freshest cuttings from Fraser fir trees grown in NC, VA, and WV. Our strands of Christmas roping and Fraser fir garland are shipped all across the country to retail Christmas tree lots and other locations. We also have Christmas garland available for fundraising efforts. Churches and other organizations buy Fraser fir trees, wreaths and Fraser fir garland from us at bottom dollar wholesale prices and re-sell them at their locations across the country to raise money for their causes at Christmas. It’s a great revenue boost. The value of Fraser fir garland all depends on how it was crafted. Thick strands of fresh cut Fraser fir cuttings yield the best strands of garland. They are interweaved and stranded together to stay together through the toughest weather. The needs remain soft and vibrant green without watering! Sturgill’s Christmas Tree Farms are family owned and operated. We work year around to maintain our tree farms and ensure that our nursery trees are optimal. We also cut small trees each year to sell tabletop Christmas trees if you are interested in creating a table centerpiece with garland and a tabletop Christmas tree.